If you’re new to cooking Thanksgiving dinner (or maybe you’re just trying to not burn the turkey this year), we have some interesting apps to help you through this hectic holiday dinner. From getting your guests together to making the most delicious Thanksgiving meal ever, we have you covered! Even if you’re a natural-born planner, you might want a better, more innovative way to plan. Here are two apps that can help get your guest and grocery lists organized. MealBoard – Making a grocery list can be painful on a normal day, but a grocery list for Thanksgiving can be a challenge for the most experienced planner. Here to help is the MealBoard app, priced at $3.99. Input recipes of your own, or a recipe from any cooking website, and this handy app will generate your grocery list for you. The app also supports major brand grocery stores, so you know how much you’ll be spending ahead of time. Paperless Post – If your Thanksgiving guest list has more people than fingers you can count on one hand, the Paperless Post app will be your hero (and it’s free!). It can send invites, track the RSVPs, and let you communicate with those attending your fantastic feast. Time to Roast – This app focuses on the turkey – or whatever else you plan on roasting. By selecting all your settings (temperature units, oven type, and preheating times) and your type of meat and the weight, the app will calculate the perfect cooking time and temperature. You can also select the time you want to have food on the table and the app will calculate a timeline for your turkey roast – from preheating the oven to serving.That will take the guesswork out of timing that turkey! Time to Roast is available for $1.99 in the iTunes store. Snapguide – While reading a recipe can get the job done, Snapguide gives you just a little more by showing a step-by-step visual guide for a variety of Thanksgiving recipes. This how-to app (which is free) is almost like having a personal chef in the kitchen showing you what to do next. From appetizers to desserts, Snapguide can get you through that tedious Thanksgiving prep. For an added bonus for those who are crafty (or try to be crafty), this app also gives visual presentations on DIY projects. Hello, post-turkey crafting with the kiddos! KitchenPad Timer – With many foods cooking simultaneously, it is easy to lose track of time for each burner, oven, or microwave (it’s totally okay if you use the microwave – no judgement here). Having just one or two timers are not going to cut it – and that’s where KitchenPad Timer comes in. The app gives you a visual of burners and oven timers, which you can name individually, add designated temperatures, set different alarms for each, and of course, keep track of the time for each food item. At $1.99, this app will help you take control of your kitchen! And how about those pre and post-turkey activities? While slaving away in the kitchen for hours, to produce what seems like only a few minutes of devouring the amazing food, is not the only perk of Thanksgiving day, there are a few apps that will help you enjoy the rest of the day with your company. Whether your activities of choice include watching football or seeing the amazing floats in the Macy’s Thanksgiving Day Parade, here are a few apps that can help you enjoy Thanksgiving day, pre and post-feast. NFL Mobile – Football has become synonymous with Thanksgiving. If you can’t get to a television, or you’re just wondering what time the game starts, the free NFL Mobile app can tell you everything you need to know – stats, times, and highlights. You can also use the app to check in on your fantasy team because seriously, you need to know who you can tease during dessert if your team is stomping theirs. The app also provides streamed video and audio so you’re always in the action. Macy’s Thanksgiving Day Parade 2014 – For 88 years, the Macy’s Thanksgiving Day Parade is now a tradition for many. This year (as they did last year), Macy’s has released a free app that lets you in on the fun even if you can’t physically be at the parade. Use the app to see video clips of classic balloons and to let the kids create their own parade balloons. The app lets you become an insider of one of the largest Thanksgiving Parades. 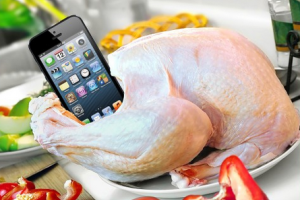 And although we highly recommend taking some time on Thanksgiving to take a digital detox and enjoy your time with those around you, hopefully these apps will help ease the stress of the day and give you more time with friends and family, all while impressing them with your planning and cooking skills.